Just few months into re-introducing its iconic true unlimited broadband plans 510 and 899, Asianet has now increased the monthly rent for the plans to Rs 599 and Rs 999 respectively. The new tariff will come into effect from June 1st, 2016 across Kerala. The plans now branded as TU 599 and TU 999 offer true unlimited broadband speed of 1Mbps and 2Mbps respectively without any FUP limits. Asianet has hiked monthly cost of both plans by almost Rs 89 and Rs 100 respectively. 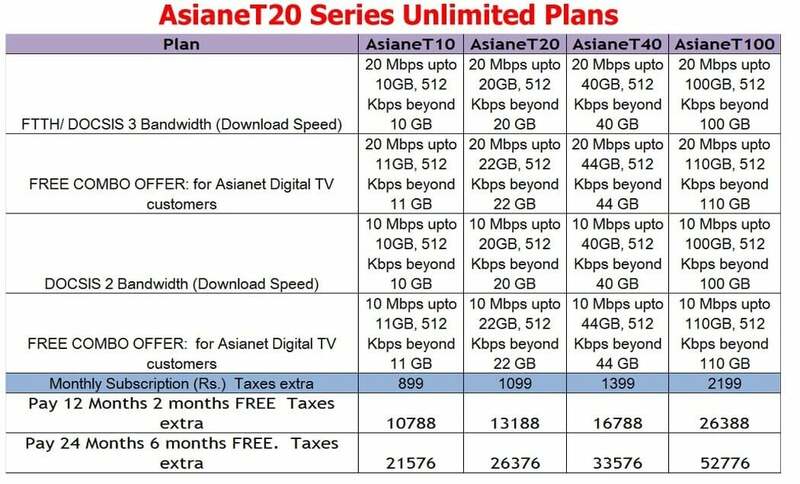 Asianet has also introduced special broadband plans for T20 cricket season. The T20 Series broadband plans offer speeds up to 20 Mbps and comes with FUP limit from 10GB to 100GB based on plan. However, the post FUP limit is limited to just 512kbps. Asianet is also providing free modem with the plans and charge Rs 999 for activation. Asianet Broadband, which provide DOCSIS 2.0 and DOCSIS 3.0 cable broadband, compete directly with BSNL in the Kerala circle. The true unlimited broadband plans from Asianet are more attractive and affordable for broadband users. Will you please elaborate that trick??? peering speed is good on torrent youtybe nd google in bsnl or asianet? I am getting 2mbps unlimited for rs 300 in mtnl. can you tell the trick ?? They are one of the worse operators to deal with. They take around 6-7 days to fix a complaint. That too after repeated reminders. Their customer care is also not toll free. You have to spend around 200 to an issue fixed and the issues keep repeating every 2 months.